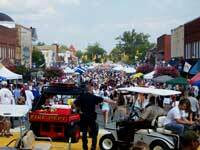 Lincolnton NC Apple Festival in September. Lincolnton, North Carolina real estate – Apple Festival time is just one of many fun times in Lincolnton, a town in the middle of things going on but as country and quiet as a small Southern town should be. Deep in history, Lincolnton was the site of Revolutionary battles and Civil War involvement. Lincolnton is a small community located off Route 321, and 25 miles northwest of Charlotte. Travel west on south Interstate 85 and exit north at Exit #17 (Route #321) in Gastonia then proceed 15 miles north on #321 to Exit #24 and turn west on Route #27 and travel 3 miles to Lincolnton center. Click on links below for listings and interactive maps.